You'll get loads and loads of advice before you get married. Some of it will be helpful and some of it … well? Let's just say that getting used to ignoring your mother-in-law is a skill you can't hone nearly well enough. But there will also be some gaps in the advice you're given! Which is annoying. 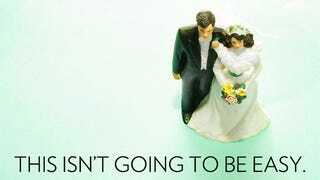 And that's why I'm sharing these five things I really wish I'd known before I got married. Banking becomes so much more complicated. If there was just one thing— just one!—I wish someone had told me before our wedding, it is this: Check with your bank to see if they allow endorsed deposits and/or the depositing of checks made out to more than one person into an individual account. What will happen before, during and after your wedding is that people will give you checks. Which is awesome! Yay for checks! But many of those people will only know you, or only know your partner, and the checks are often made out to one or the other of you, or to both of you, or to Mr. & Mrs. His Last Name Spelled Wrong, or to Mrs. & Mrs. Both of Your College-Era Nicknames or to Mr. & Mr. Hyphenated-Last-Names-Even- Though-You're-Not-Hyphenating-Your-Last-Names. It's a mess. It becomes an even bigger mess when the time comes to deposit those checks and you learn, as we did, that your bank no longer accepts endorsed checks (those are the ones made out to you that you sign and hand over to someone else for depositing) or that they only allow the depositing of checks that are made out to only the person whose name is on the account into which you're trying to put the money. In our case, Bank of America, where both of our personal accounts were, no longer allows for either, which meant that we HAD to open a joint checking account in order to deposit the checks we got at our wedding. We were planning to open a joint account anyway, but weren't in any rush until that little hiccup occurred, and then it was just ONE MORE THING we had to deal with post-honeymoon. If I'd known, we would have opened the joint account before the wedding so we weren't holding onto those checks for several weeks! This policy does, of course, make it tricky for people who don't intend to have a joint account at all. If you fall into that camp, it will be especially important for you to look into these types of policies before the wedding and figure out how to proceed. Wedding gifts will take over your life. A discussion of those checks brings us nicely into this next part: You will write thank you notes for the rest of your life. Yeah, yeah, that's a slight exaggeration. But only slight. Truly, you will not believe how many thank you notes you will write. The thing is that those thank you notes are important for three reasons. The first is that it's good manners. The third reason is the flip side of that coin, which is that receipt of a thank you note provides the gift giver with confirmation that you received the present. In another instance, a non-registry gift was sent to my home in New York during the weekend of our wedding in Boston and went missing. The sender knew there was a problem when she didn't get a note ("This isn't like you, you've been so prompt with all your notes!") and was able to call in an insurance claim after confirming with me that I never got her gift. Speaking of that non-registry gift! Register, even if you find it gauche, for at least a small number of gifts. Some people prefer to give gifts over money, and if you don't register they'll buy you terrible things you don't want. They'll still manage to buy you terrible things you don't want. (I'm the proud owner of three cookie scoops because one of my mother's friends thought she knew better than me what I needed in my life. I can assure you that no one needs three cookie scoops in their life.) But you'll at least curb that phenomenon a bit if you register. Plus, after the wedding almost every store that offers registry services gives you a "completion discount" — which is great for picking off things you didn't get/would just like to have in your life. It's incredibly important to have a structured conversation about The Big Stuff. You probably know that you should talk about things like money, and children, and long-term goals and blah blah blah blah blah. But planning a wedding is insane, and it's all too easy not to make time for those conversations. So be sure to build it into your process. For couples opting for a religious wedding ceremony, you're likely to find that your officiant requires you to engage in some type of structured conversation, whether it be for individual couples or in a group setting, or both. My husband and I were married in the Catholic Church, which meant that we had to attend Pre-Cana, as well as a short session with the priest who married us. Of course, he was hard of hearing so the portions in which he spoke to us alone while they other stood outside the door were, um, not exactly private because we had to SHOUT our answers at him. As an aside, those are the kinds of things you're going to remember about your engagement and wedding. Screaming at the priest. Not, like, what the favor boxes looked like. Just bear that in mind when you find yourself losing perspective during the planning of the wedding. If you don't have premarital counseling built-in by your wedding officiant, you can and should still consider your option for having a third party-led conversation. The Mayo Clinic defines premarital counseling as, "a type of therapy that helps couples prepare for marriage. Premarital counseling can help ensure that you and your partner have a strong, healthy relationship — giving you a better chance for a stable and satisfying marriage. Premarital counseling can also help you identify weaknesses that could become bigger problems during marriage." Ain't no shame in that game, and if anyone tries to tell you differently, ask them how their marriage is going. That ought to shut them up! What people meant when they said, "The first year of marriage is hard." This is a refrain you'll hear over and over and over again during the time when you're engaged. Except … no one ever explains why it's so hard. Now then, I have a theory on why the first year of marriage is so hard and you can tell me what you think of it: I think the reason that the first year of marriage is so hard is that you spend your engagement focusing on all the reasons you're so excited to marry this person, and then first year being actually married to them thinking of all the reasons why you can't believe you married them. "How could I have married someone who's so bad with money?" "Why did I marry someone who I can't rely on to attend family functions with me?" "What possessed me to marry someone who is a habitual nose-picker?!?" Hopefully, during those times of doubt, you can pull on some of things you learned during your premarital counseling and work through them. Being a team means making deliberate choices. One of the best pieces of advice I got while engaged came from my agent; it served us so well that I want to pass it along to you as part of a larger point about teamwork and presenting a united front: Make a pact to stay together during your wedding events! It's too easy to go off to say hi to someone, then another someone, and on and on and then get to the end of the night and be like, "Huh. I didn't see Alex all night." Which is fine at cocktail parties but not really ideal at your wedding. That lesson can be applied more broadly to your marriage. It's important to remember that being a team doesn't just happen. It takes some work. I feel like maybe there's a term for that? Oh right, teamwork. I was totally blanking on that, but you knew exactly what I was getting at. This is I Thee Dread, Jezebel's site dedicated to the fuckery of the wedding industrial complex (and marriage). Know something we should know? Email us. Horror stories welcome.